The Blank Vote is available as a choice in some electoral systems around the world. It provides the voter with the option to indicate her/his disapproval with all of the candidates in an election. Like 'None of the Above', the Blank Vote is based on the important democratic principle that public support for elected candidates is only meaningful if people also had the option to show that they did not support any of the candidates. 'Blank Vote' is established practice in Spain (voto en blanco), France (vote blanc), Colombia (voto en blanco), and in the United States Green Party. How to vote 'Blank' in the UK? The blank vote option is not provided in the UK. Officially, British people can therefore only vote 'Yes' to the candidates on offer, and are unable to vote 'No'. Like many people, we believe that's not good democracy. The 2008 London Mayoral and Assembly elections set the precedent for blank votes being formally recognised and retained in results: 13,034 blank votes were cast in the Mayoral election, and 39,894 in the Assembly Member election. The problem is that with some protest votes left blank, and others with scribbled comments, the authorities are never forced to acknowledge them as clear protest votes. As we show on the Making Protest Votes Count page, the UK Electoral Commission guidelines advise that in General Elections, blank votes and other potential protest votes be grouped together with mistakes and unclear votes, to be classified as 'unmarked or void for uncertainty'. To challenge and change this official silencing of UK protest, protest voters need to remove the uncertainty. Your protest vote needs to be clear beyond dispute. So don't leave your ballot blank, and of course don't put a tick or cross anywhere! 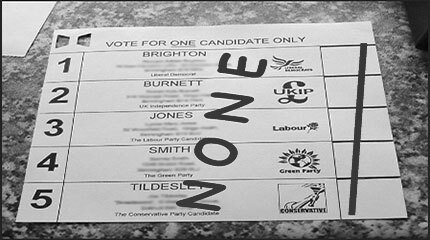 Write NONE across your ballot paper, and put a line through all the boxes. Don't be silent. Improve UK politics. Blank votes sustain the current classification of all UK protest votes as 'Voter intention uncertain'. So make your protest clear by writing just one word: NONE. In Lebanon, this crass election poster originally read 'Be Beautiful and Vote'. It prompted a counter cam­paign which reworded it as 'Be Intel­ligent and Vote Blank'.